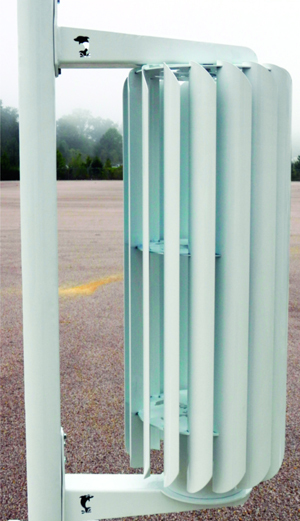 Kronos Energy Solutions designs and manufactures small vertical-axis turbines. Company president and CEO John Bogensberger launched Kronos in 2009, initially outsourcing fabrication work such as oxyfuel cutting of turbine components. Two types of part-quality issues typically plague abrasive waterjet cutting: stream lag and taper. Both of these accuracy hurdles can be cleared by significantly reducing cutting speed, but cycle time and cost per part rise with equal significance. Stream lag—evidenced by the exit point of the waterjet lagging behind the entrance point—causes geometry errors as it sweeps out cone shapes instead of circles, and causes corner wash-out on inside corners. And, V-shaped taper naturally occurs as the power of the waterjet dissipates during cutting. The faster the cutting speed the greater the kerf-taper error, which can be as much as 0.01 in. per side. As with stream lag, slowing cutting speed will minimize taper, but will restrict productivity and increase garnet consumption per inch of cut. 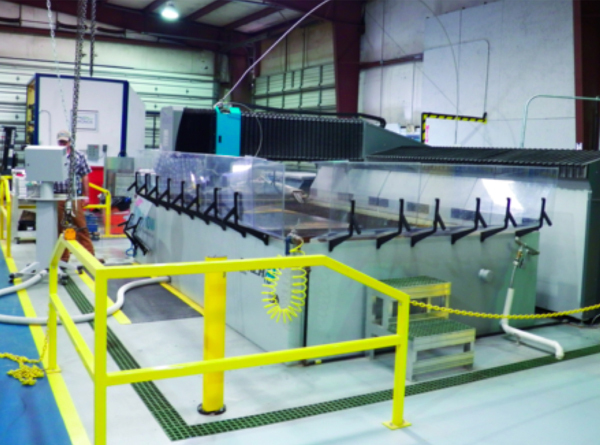 Since Kronos installed this Mach 4 FlowJet waterjet-cutting system—outfitted with a 13- by 6.5-ft. table—costs compared to outsourcing work have reduced dramatically, allowing the company to pass savings directly onto its customers. Flow’s Dynamic Waterjet with Active Tolerance Control avoids taper and stream lag during flat-stock cutting, says the company, maximizing cutting speed. The technology combines control software with precision machine-tool design and an articulated end-of-arm wrist. Additionally, Kronos can easily scale ring gears for its wind turbines, or the vane head size, to meet specific customer performance requirements or space constraints. And with its waterjet-cutting machine, it can make such product-design and configuration changes up to the last minute without the delay or extra charges when outsourcing. Sales director Frank Garavelli describes another waterjet-cutting success story. “We have a new customer that was purchasing raw material, sending it to a blanker and then onto a metal-processing facility,” he says. “Parts fabricated on a punch press required secondary deburring, and the parts had a 0.030-in. dimensional variance from top to bottom. In all, six different operations performed by various suppliers were required to produce parts to print. Since adding waterjet cutting to its inhouse resume of fabricating processes, Kronos has been able to expand its customer base beyond the wind-energy market and into other green markets. For example, it’s fabricating aerodynamic skirt-side fairings for long-haul trucks, to reduce drag and improve gas mileage. “With our FlowJet, we can customize the look to meet trucker or fleet-design requirements,” says Bogensberger. “Whether it’s a logo, contact information or an applique to match artwork on the truck, we can quickly meet customer expectations.” Other new ventures have included custom flooring applications and even cutting 5-in. concrete for a church sculpture. Article provided by Flow International, Kent, WA; 253/850-3500, www.flowwaterjet.com. Road cutting machine manufacturers, concrete cutting machine manufacturers@ Koshe Welding Pvt. Ltd.,road cutting machine manufacturers in chennai,concrete cutting machine manufacturers in india.